A group of 10 experts, known as the Empathy Group, has sent a lawsuit against Russia to the European Court of Human Rights regarding the high- profile death case of Georgian citizen Archil Tatunashvili, who died in unclear circumstances in Georgia’s occupied Tskhinvali (South Ossetia) region in February, on the territory which is currently controlled by Russia. The Empathy Group accuses Russia of the violation of Article 2 of the European Convention (the right to life), Article 3 (prohibition of torture), and 5 (right to freedom), Article 8 (respect for private and family life) and Article 13 (effective remedy). Autopsy made on the Tatunashvili’s body, which was transported to the Tbilisi-administered territory only after about a month from death, by the Tbilisi Forensic Bureau also revealed the wounds which could lead to death. 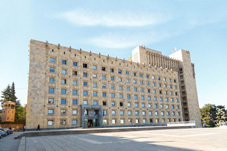 However, Tbilisi fails to conduct a thorough autopsy due to the lack of Tatunashvili’s internal organs, which were removed before the body’s handover. Tskhinvali continues to claim that Tatunashvili died because of the heart failure. Tatunashvili and two other Georgian citizens were detained in the occupied Akhalgori area by Russia-controlled border guards on February 22, allegedly for participating in the Russia-Georgia 2008 war. However, Tatunashvili was in Iraq at that time, defending international peace. Tskhinvali media announced the death of Tatunashvili on February 23 and stated that the latter had an incident with some of the detention facility staff and fell down a flight of stairs. However, the de facto security service of Tskhinvali claimed the man died from heart failure. The Russia-controlled leadership of Georgia’s occupied Tskhinvali region has returned the body of the Georgian soldier to his family 26 days after his death.